Smoke is usually from bad valve seals, or bad rings. If the engine runs fine otherwise I'd suspect that it is a problem with the valve seals. If it has any sort of miss or studder then I'd suspect a valve. You can change valve seals without any additional machine work. but if you need valves you will have to take the head off the engine and have the valve seats resurfaced and the valves themselves ground back to spec. the only time you need new valves is if you burn through one, which will cause problems, most likely presented as a loss of power or a 'miss' to the engine. Does this smoking situation clear up after the initial 10 minutes? I'm thinking that oil is leaking onto the backs of the valves and that's how long it takes for the valves to get hot enough to burn it all the way off, and I suspect Valve stem seals, not valves. Parts are available at any parts store or engine machine shop. Just to be sure, how do you know it is a Ford inline 6 versus the 258 inline 6 typically used in Jeeps? My Jeep has the 258.
there is a sticky post in the eye candy section that details how to post pictures. Or email them to me and I'll post them. Smitty - I didn't get the pics. Did you send them to vinny@yourcousinvinny.com? If not, try again. Someone likely put a late model AMC inline 6 into that Jeep. I can post pics of that engine as well if you like. Well dialup users are going to hate me, as the pictures you sent were almost 2mb each.. but I uploaded them via my phone which doesn't have any image resizing software on it, yet, anybody got a suggestion for WM6.1? Oh ya, I don't know what it is. 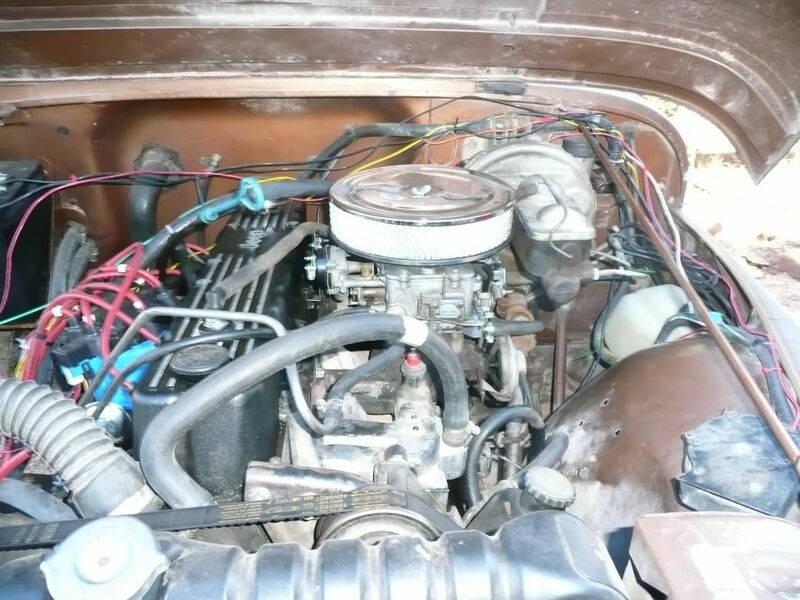 I can tell you that it is NOT a small six ford (144/170/200/250) I can tell you that it is not a 216/223/262, and I can also tell you that it is not a 240/300. I also know that it is not any of the Chebby sixes that I'm familiar with (230/250/292/235). It's not a slant6, nor is it any of the 232/258/4.0 family of sixes. Can see distributor, and what looks like a remote oil filter, fuel pump is mounted down low on the rear of the block, right below 2 side side covers. You can also get a good view of 2 large hoses that are being plugged by lugnuts, which I find interesting, th emotor appears to be 'vintage' but the hoses suggest emission controls..
Can see air cleaner, alternator, exhaust manifold, starter/starter solenoid (looks like GM type starter) homade motor mounts. I've posted the pics on my Jeep forum and will ask what it is. Likely the original engine. Not a Willys, Pontiac, Studebaker or Kaiser either. Dang. That leaves Hudson, Packard and Crosley. ludwig wrote: Dang. That leaves Hudson, Packard and Crosbey. What about Stills and Nash? And definately not an overhead cam Poncho. A reply to my post on the Jeep forum. PO=prior owner. 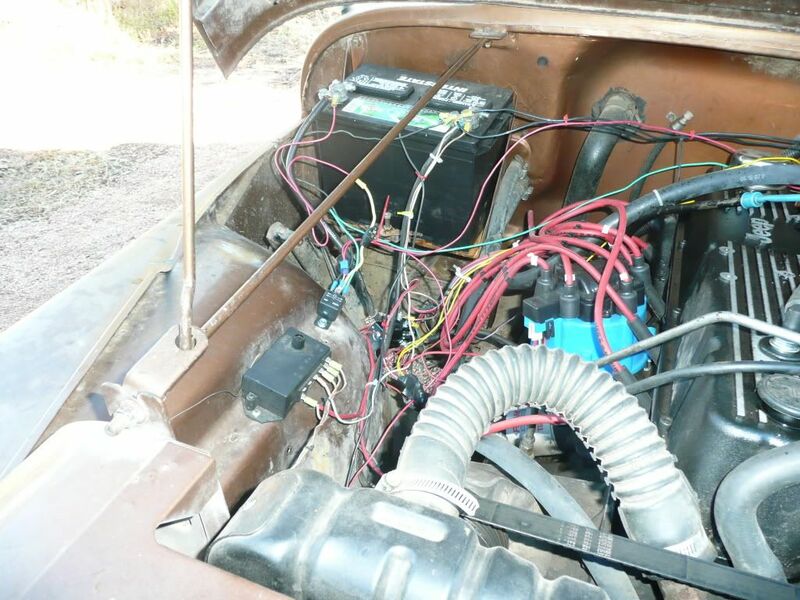 www.virtualjeepclub.com wrote: The PO of my Willys Wagon repowered it with a 1950s 223-6 Ford engine. It kind of looks like the one you posted. The air cleaner is a 'space saver style' that was used in some Ford cars of that period. 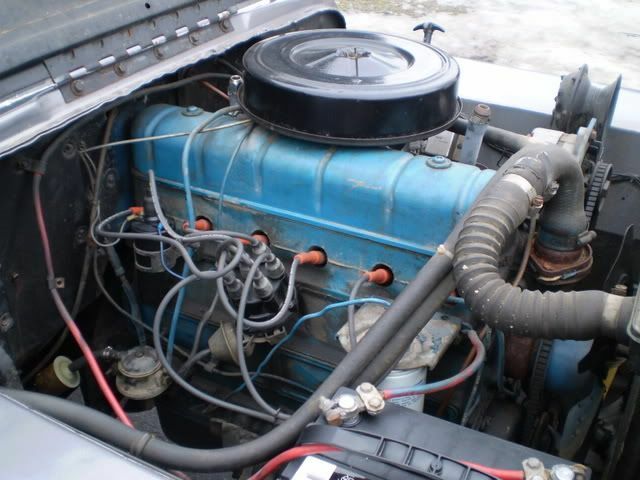 The PO was very creative in getting this engine to fit in a 1954 Willys Station Wagon. 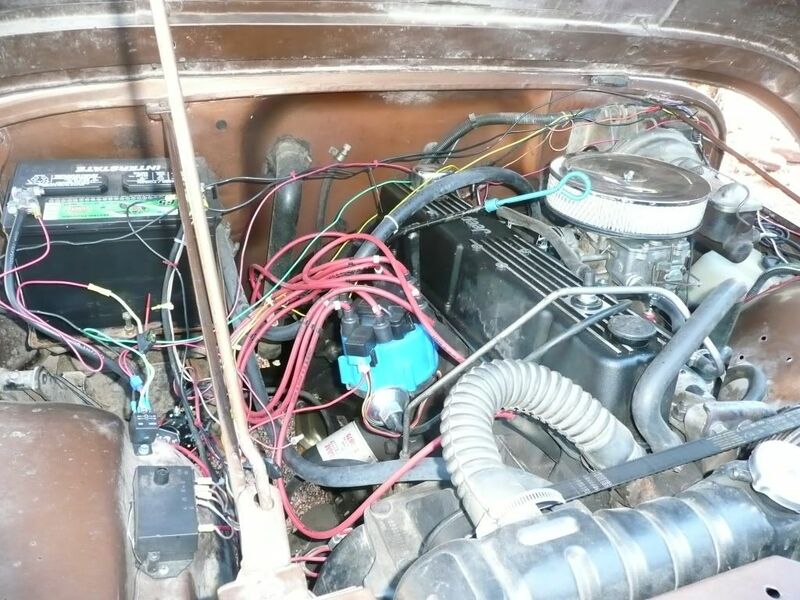 According to the pictures on edwin's site the starter is on the wrong side, and I don't recall seeing any old Ford starters with a solenoid attached to them. Anybody on here a cornbinder fan? 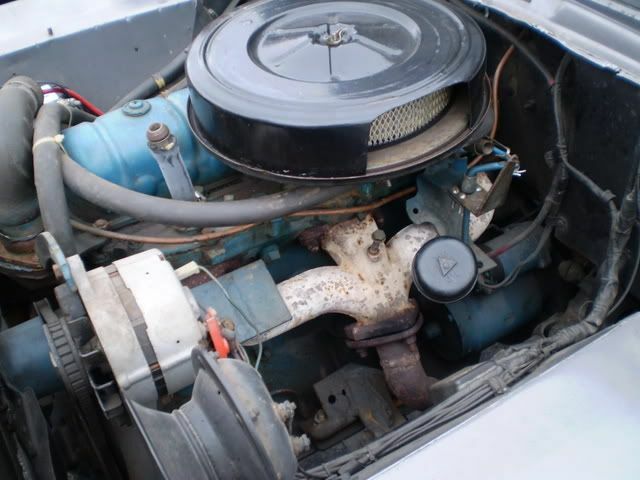 I'm having troubles finding a picture of an International 220 i6 (used from the 50's-60's I think). Dad's got a couple early trucks sitting in the pasture (holding the dirt down) and this could be one of those motors. For what it's worth, I forgot to mention on this forum that the "FORD" script was stamped on the alternator bracket. It may just be a Ford alternator bracket on a different make engine. I'm hoping that if enough people see these posts - someone will have a definite answer. 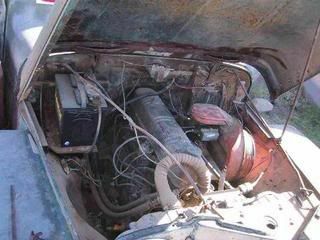 "Its a 58-65 AMC 195.6 came in ramblers and such. First off is the valve cover with the screws that hold it down, second is the fuel pump at the rear of the engine, third thing I noticed is the exhaust manifold has three branches with paired exhaust runners, The last thing is it has an AMC style distributor. I could tell its not a ford since the carb and exhaust are on the drivers side, I think fords are always passanger side (not sure though). Vin man I am pretty sure the later AMC 6cyls can be swapped in place of the 195.6 wih a change of the motor mounts. If I remeber the bellhousing bolt pattern is the same, Dont take my word though, you might want to research it a little more. If I remeber right the 195.6 requires head retorquing every 8-10,000 miles"